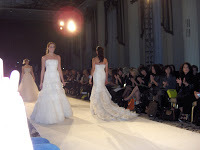 We recently spent several days in New York for the Spring 2010 Bridal market. Our days were filled with viewing gorgeous gowns and, once we returned to Texas, our days were filled with making hard decisions about gown orders for Stardust Celebrations. After viewing gowns from designers such Lazaro, St. Pucchi, Katerina Bocchi, and Alvina Valenta, it was obvious that there are several new trends for Spring 2010. From ruffles to flowers to floaty skirts on gowns, organza seemed to be everywhere. We also saw tulle skirts making their appearance for the first time in several years. Each designer line had at least one, if not two, tulle skirted gowns. The tulle skirts are embellished with embroidery, lace, and organza. Fuller skirts, ballgowns and box pleats were also shown. While strapless bodices continue to dominate, there were a wide variety of sleeve options including off the shoulder, some halters, and cap sleeves. We did not see many gowns with spaghetti straps. The “cold shoulder” gown is still very popular. Gowns that we purchase at Stardust in the fall will actually be in the bridal salon around January, just in time for the 2010 Winter/Spring bridal trunk shows. Can’t wait to get the new gowns! October has been just wild! We had a ranch wedding in Amarillo that was quite complicated. Tents, roads, furniture, bathrooms, electricity–it all had to be brought in to a location right on the edge of the Palo Duro Canyon. A true western wedding and truly beautiful. 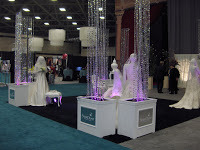 The next day was the Unveiled Bridal Show in Dallas. We had two booths and provided over 60 gowns for the fashion shows and the gown galleries. The show was beautifully laid out. Brides entered through a decorated ceremony area. There was a bridesmaid gallery, reception decor showcase, mothers’ gown gallery and a groom’s club. The vendors that participated stepped up to the plate and really provided some well done and tasteful booth decor. The main stage fashion show was awesome. The models that we met about a month ago were now made up and styled and looked like the total professional runway models that they are. Very impressive! The Unveiled Bridal Show returns to Dallas on Saturday, March 7. As we were recovering from that busy weekend, we started to get ready for the James Clifford Trunk show at Stardust. James Clifford is actually Jim Hjelm (his given name is James Clifford Hjelm). Anyone involved in the bridal industry recognizes the name Jim Hjelm. He’s been a major designer and player for 50 years! 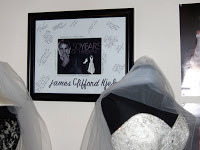 Coinciding with our trunk show was the meeting with the winner of the James Clifford National Bridal Gown Giveaway. The bride worked with Jim to chose her gown. The folks from AMS Pictures were in the store filming for “Girl Meets Gown” and filmed the gown giveaway and also interviewed Jim. Our staff presented Jim with a signature frame congratulating him on 50 years. It’s now hanging in the James Clifford showroom in mid-town Manhattan. How fast can we run? What a busy week! We’re finally opening our bridal designer outlet store this week. Price tags and hangers and moving and jewelry and cleaning…whew! Also this week we’ve got a Special Occasion Trunk Show with JSS Knits and a bridal trunk show with Alvina Valenta Bridal. Plus we’ve got Donnie Brown here at Stardust on Friday and Saturday to sign his new book. We just put the champagne in the frig to chill for Friday. Romanos bakery (a favorite!) is providing us with mini cupcakes for the book signing. D Magazine is co-sponsoring the event with us. Next week, there’s a HUGE out of town wedding that will take four of our staff off-site. More buy valium tabs details to come post-wedding. The new bridal show “Unveiled” is next weekend as well and we’ve got two booths, runway shows and lots of transporting to do. I haven’t even finalized our schedule for the New York bridal market which is in just 3 weeks. It looks like gown embellishment is back again. We’ve already seen a lot of beading and embroidery. Lace also remains very strong. We anticipate that a lot of the designers will be bringing their price points down due to the weak economy. Can’t wait to see what’s new! There’s a new bridal show “Unveiled” in Dallas in October. We’re involved in the fashion shows and last Sunday six models flew in and were at both stores for gown selections and fittings. The interesting thing about fashion models “off duty” is how non-glamourous they look. 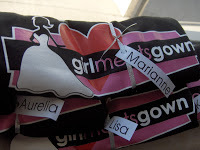 We spent the entire day fitting tall size 2 girls into sample bridal gowns and bridesmaid dresses. Tuesday night, we attended the AACWP annual bridal fashion show. This show featured bridal trends. When you see a “trend” show, the models are high glam and wearing gowns that are more conceptual than wearable. Fun to look at! September 25 promises to be very busy — two trunk shows plus a book signing event. Alvina Valenta Bridal and JSS Knits Special Occasion are the trunk shows. 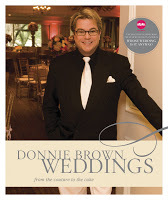 Donnie Brown (from “Whose Wedding is it Anyway?”) will be at Stardust signing his new book “Donnie Brown Events”. Champagne, wedding cake samples and hopefully–books!! The books aren’t here yet. The new store is coming along nicely. Lots of problems have been solved–we now have display bars, phone, computer, staff, etc. Waiting for new signage and aiming for a Sept. 25 opening. This past week started off with a system crash! The stores are networked on the same system and nothing was working. It took about 4 hours to get resolved and we never did find out what was wrong. It’s Saturday now and the week has been steady. We’re seeing brides with May 2010 wedding dates. Lots of brides and moms are in because of the Labor Day holiday this weekend. Fall trunk shows begin next weekend at both stores. We did a mailing of about 500 postcards plus the website and the wedding magazine email blasts. Last Friday we had a “green light” party with the folks from AMS Pictures. They’re the Dallas company producing the series “Girl Meets Gown” for WEtv and we were celebrating the green light given on 6 more episodes. It airs in 2010. We’ve got the film crew here every week and while that sounds like a lot of fun, it really is more like a lot of work. But it’s interesting and the brides that are featured are wonderful. The party was great except the margaritas were really lame. I think there wasn’t any tequila in it! The new store opens at the end of this month (we hope). Right now, no carpeting, no rods to hold gowns, no computer and no phone. There’s lots to be done before those doors can open.